NARRATIVE: On December 9, 2009 9 units from the Spokane Fire Department responded to a possible structure fire at 1311 S Walnut St. Arriving crews found a small fire started when an unknown subject utilized impovised incendiary devices thrown at the structure. Witnesses at the scene reported an unidentified person running from the scene with their arm involved in fire. This incident is being investigated by the SFD Special Investigaion Division in cooperation with the Spokane Police Department. The SFD is asking anyone with information to call the SIU at 344-FIRE (3473) to report any knowledge they may have concerning this incident. DAMAGE EXTENT: Minor damage to the interior of the structure. 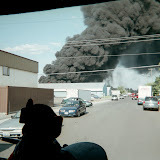 NARRATIVE: On December 7, 2009, at 1:09 Pm, 6 companies of the Spokane Fire Dept, 4 engines, 1 heavy rescue, and 1 senior-ladder under the direction of Battalion Chiefs Bruce Moline and Bob Green responded to a reported garage fire in the alley behind 603 S Ralph St. The first arriving company, SE14, reported smoke coming from a detached 2-car garage behind this address. After ensuring everyone was out of the structure, companies began a coordinated attack and quickly controlled the fire. There were no injuries to civilians or firefighters. PROBABLE CAUSE: The Spokane Fire Dept SIU determined the fire was accidentally caused by an improperly installed wood heating device. The Fire Dept would like to remind citizens to follow all code requirements when installing home heating devices and to always maintain adequate clearance around them. During periods of extreme cold weather heating devices can be called to operate at a much higher capacity and this can exacerbate any existing problems. DAMAGE EXTENT: Moderate heat damage to the interior of the structure with smoke damage throughout. The Executive Board of Local 29 will be accepting candidates for appointment, to fill the position of Vice-President. The duration of this term will be for one year and then will be filled by the standard election process. The names must be emailed to Greg Haff at ghaff@spokane fire.org no later than 1700 hours Wednesday December 16th 2009. The Executive Board Positions will be filled by the three candidates with the most votes. NARRATIVE: On Sunday December 6, 2009 at 4:50 AM, 6 Companies of Spokane Firefighters, 4 Engines, 1 Heavy Rescue and 1-Senior Ladder under the direction of Battalion Chiefs Bruce Moline and Dan Brown responded to a reported house on fire at 6002 North Forest Boulevard. The neighborhood fire company arrived within 4-minutes and reported smoke showing from the eaves of the home and flames from the rear of the house. The incident was upgraded to a working fire and an additional engine added to the alarm. Once confirming the family of four was accounted for, engine companies stretched pre-connected attack lines to the main body of the fire while the ladder company set ladders and opened the roof for ventilation. It took 22 Firefighters just 20 minutes to locate and knock down the fire and control the incident. Firefighters were able to limit the damage to the home's contents by placing tarps on the majority of the effects and protecting their property while the damaged area was overhauled. No civilians or firefighters were injured as a result of the incident. PROBABLE CAUSE: The cause of this incident is under investigation by the SFD's SIU. DAMAGE EXTENT: Extensive damage to the rear of the home and moderate smoke damage throughout the structure. SFD is cooperating with Avista, Red Cross and the insurance company to assist the residents in securing temporary accommodations and to make certain the structure is secure and safe. NARRATIVE: 12 apparatus and 21 Spokane Fire Department firefighters were dispatched to a reported single family residence structure fire in the north central area of the city at 9:41 am today Friday, December 04, 2009. Vigilant neighbors noticed light smoke coming from the house and called 911. The first crew on scene was Spokane Ladder 2 who reported light smoke coming from the rear of the house. No persons were reported in the structure. The fire response level was not upgraded for additional apparatus. Forced entry into the structure was not necessary. Light smoke conditions and little fire were found inside. After advancing a hose line into the house the fire was quickly extinguished as a result of a coordinated attack on the fire. Damage was contained to the upper floor. Four adults and one child were displaced because of damage to the structure. Red Cross will arrange temporary lodging for the residents. Spokane Fire Department Investigators responded to the scene. No injuries reported. This is the time of the year where an increase in the number of space heaters contributes to increased fire dangers. Portable heaters should be plugged into properly sized wiring that is designed to handle the load of the heater. Overloaded wiring can heat up and cause fires in the walls.